The ultimate purpose of a battleship is to carry guns. Everything else - armor, engines, living quarters - ultimately exists to support the delivery of high-velocity steel to the enemy. As such, it's a topic which deserves a close look. As you probably expect by now, we'll start with HMS Warrior. She carried a total of 40 guns: 26 68-pounder smoothbore muzzle-loaders, 10 110-pounder rifled breech-loaders,1 and 4 40-pounder rifled breech-loaders. Odd though it may seem, the best of these guns were the 68-pounders, firing 8" iron shot. 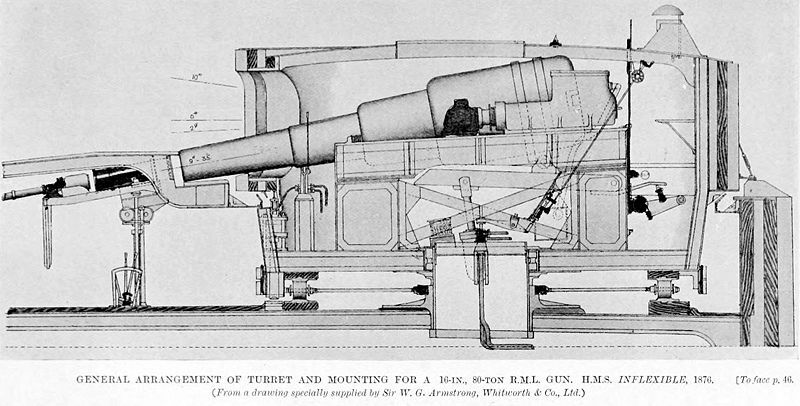 The last and largest of a long line of British cast-iron smoothbores, these guns had developed a formidable reputation, most famously in battering the walls of Sevastopol. They were the only weapons capable of penetrating the 4.5" armor of Glorie, and the original plan had been to arm Warrior with 42 of them.2 However, the development of the Armstrong breechloaders caused these plans to be revised, with some of the 68-pounders replaced. Unfortunately, while the Armstrong guns were a definite step forward technologically, they were a step backwards from an operational standpoint. Even on a good day, the 110-pounder was not as effective as the 68-pounder at piercing armor,3 and there were many bad days. 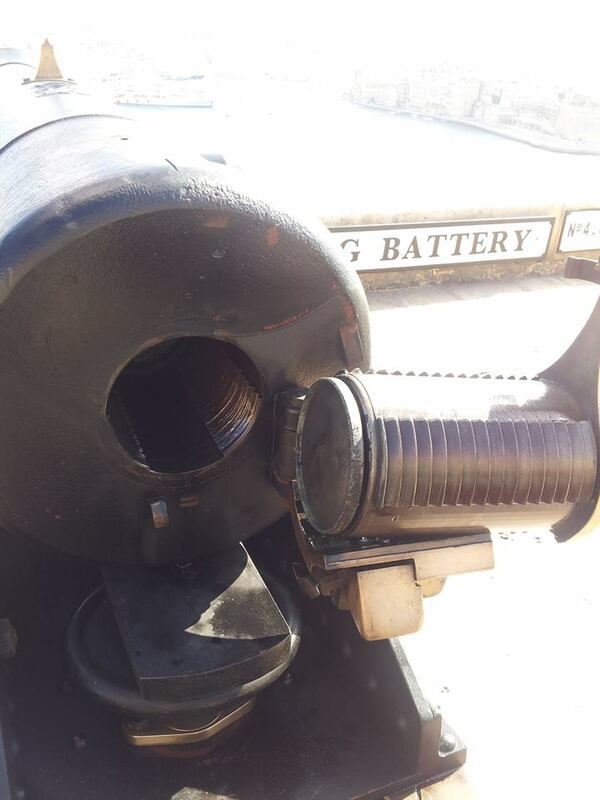 To load the gun, the large, hollow screw at the breech was loosened, and the block it secured lifted out. The gun was loaded through the center of the screw, and the block replaced. The problem was that the crew simply tightened the screw as much as they could, and there was no positive closed position. During the bombardment of Kagoshima, the squadron's 21 Armstrong guns suffered 28 accidents in the course of firing only 365 rounds. 110-pounder on a pivoting slide mount on Warriors deck. Most of Warrior's guns were mounted much like guns had been for centuries, on wheeled carriages secured with rope to absorb the recoil.4 They were run in and out by their crews, much as had been done in Nelson's day. The gunports were narrower than normal, and the guns pivoted around a bolt in the sill instead of further back. However, the ports were taller than was normal on a battleship, to allow Warrior to fight at long range. 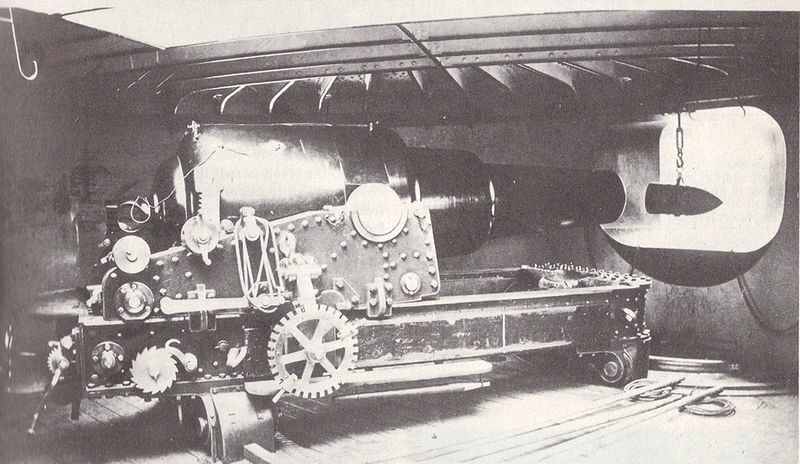 The gun was supported in the carriage by a pair of cylinders on either side called trunions, and wedges were used to raise and lower the muzzle. 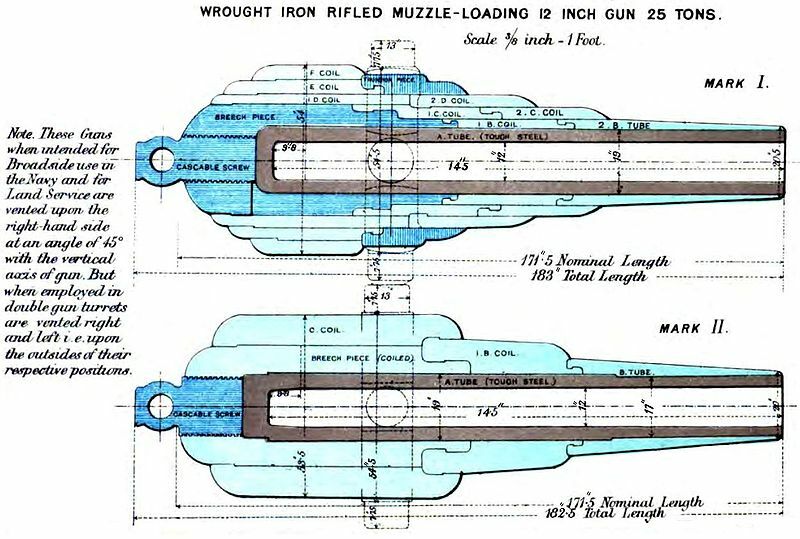 The failure of the Armstrongs soured the RN on breech-loaders, but the drive for improvement over the smoothbores was still there, and the Rifled Muzzle-Loader (RML) was the result. This gun was built around a steel tube, with wrought iron tubes wrapped around it for greater strength. The shell had studs on the side, which engaged the grooves in the barrel. The resulting gun was cheap and safe, but not particularly effective. 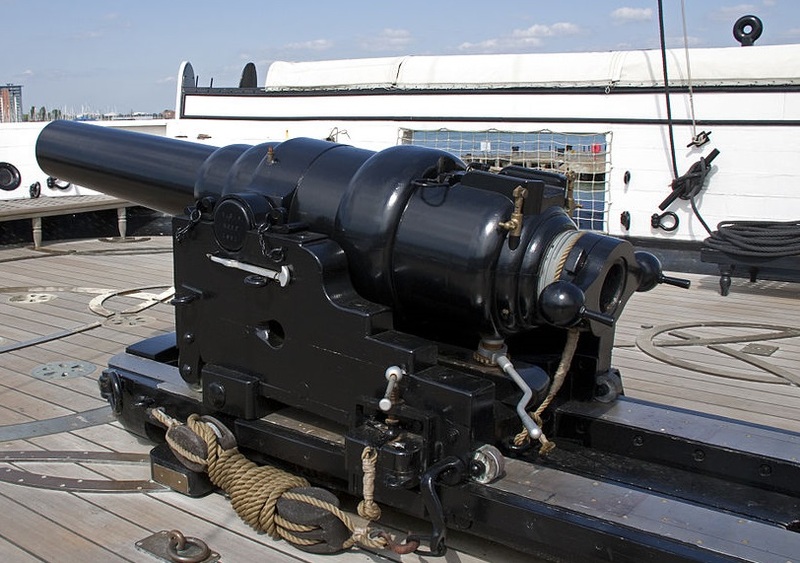 It was introduced starting in the mid-1860s, and was made in sizes ranging from 6" up to the massive 16" guns used on HMS Inflexible. While it might seem intuitively obvious that the turret would kill off the muzzle-loader, this was not in the case. In fact, external loading mechanisms meant that muzzle-loaders actually required a smaller, simpler turret. 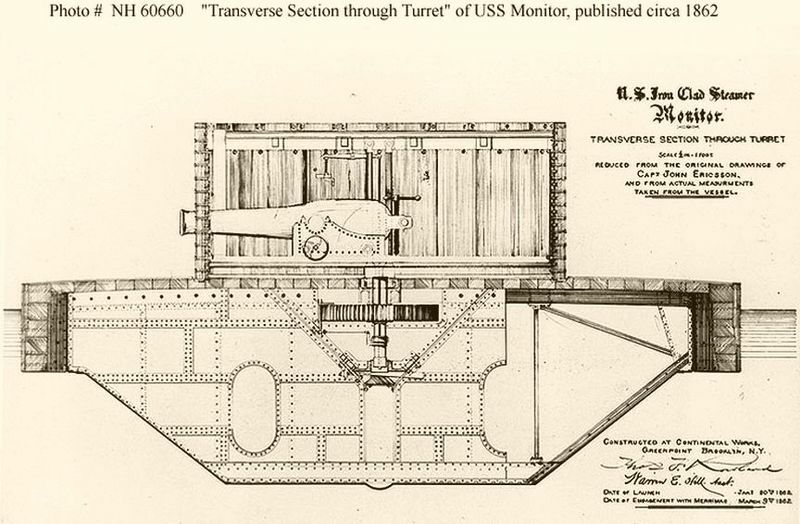 The rammer was mounted under the deck, and the turret was trained and depressed to bring it into line with the rammer. This meant that ammunition didn't have to be passed into the turret, either. Initially, loading and ramming was done by hand, but in the mid-1870s, power operation was used.8 Hydraulic recoil mechanisms were also introduced, more effective and faster to work than simply having the weapon slide across the deck with friction and ropes to slow it down. 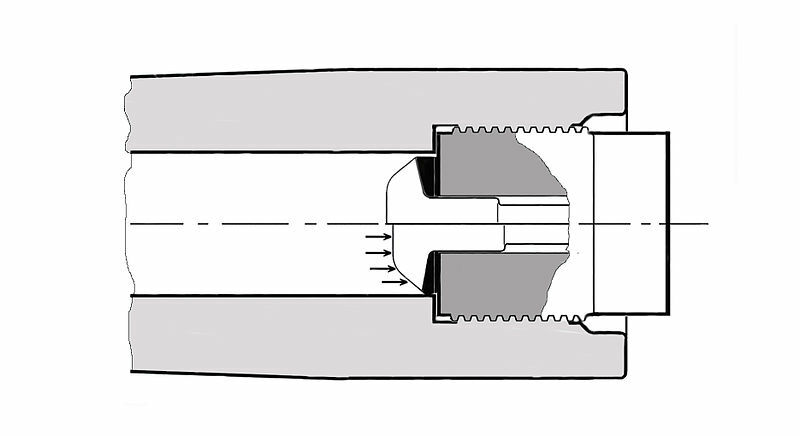 The main alternative to the turret was the barbette. This was a tub mounted on the upper deck, which the guns retracted into to load. 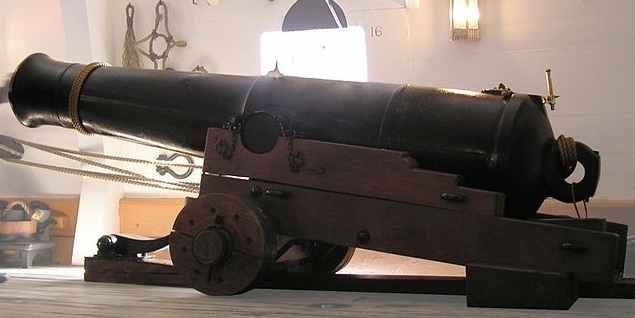 With the slow-firing guns of the day, the open-topped barbette was considered sufficient protection, although some nations mounted light hoods over theirs to provide protection from quick-firing guns. What ultimately killed off the muzzle-loader was improved powder. The new powder, called brown powder, burned more slowly than black powder. This let guns reach a higher muzzle velocity, but required longer barrels, which couldn't be loaded from the muzzle. Typical RMLs were 12-13 calibers9 long, while the first BL guns were 25 calibers. There was a corresponding rise in muzzle velocity from 400-420 m/s to 580 m/s for the 12" guns. Over the intervening years, the problems of sealing the breech had also been solved. 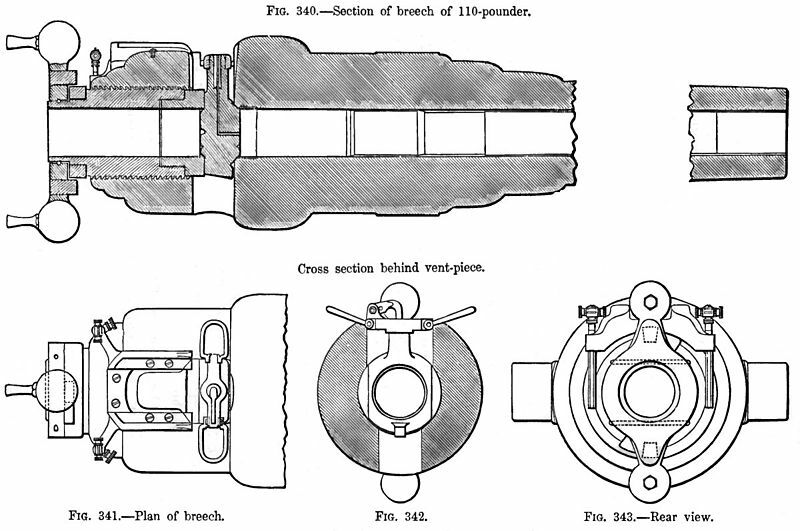 Instead of a removable block and a separate screw, the block itself was now locked into the breech with an interrupted screw, which was usually in 5 or 6 segments. This meant that the screw only had to be turned through 30 or 36 degrees to lock it, although the block had to be fairly deep to provide sufficient bearing surface to hold it against the powder. To stop gas from leaking around the edges, a device called an obdurator was used. When the gun was fired, the pressure pushed mushroom-shaped obdurator back, forcing the asbestos washer to seal the breech. The system, invented by Charles Ragon de Bange, is still in use today. 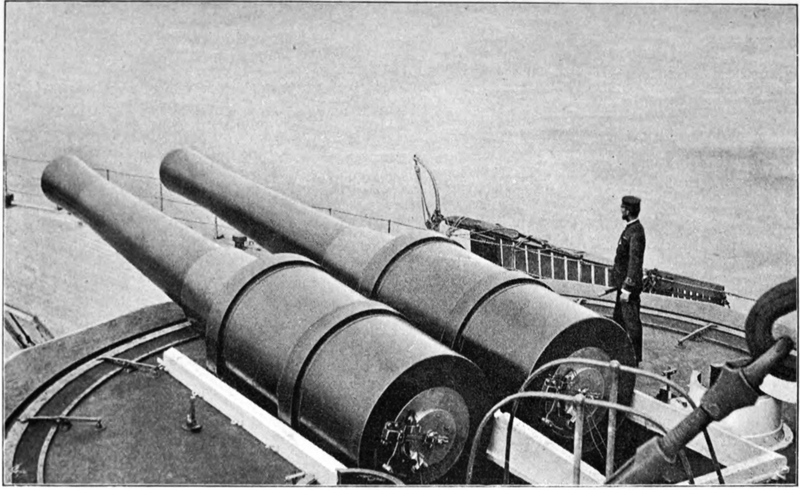 By the 1880s, naval guns had come a long way from those mounted on Warrior, but there was still a long way to go before ships like Dreadnought became practical. We'll discuss that transition next time. Anyone who wants more details on the early breechloaders should check out Rob Brassington's incredible breakdown of HMS Colossus. How did they manage to make a rifled gun with a much heavier shell less effective at piercing armor? I don't know anything about cannonballs as such, but I do know that .22LR accuracy with standard loads goes to hell after about a hundred yards, because that's about when the round slows down into the transonic range. For context, this is the gun and this is the view down the barrel. Here's the battery in Google Street View. Feel free to use any or all of those if you prefer. I will ask that you re-host these images if you want to use them, just in case I ever change up my Facebook privacy settings. I’m mostly wondering if the spherical cannonballs will be less affected by transonic flight than other projectiles. I genuinely don’t know, and don’t really want to go to the trouble of finding out. @Alex Those are 32-pdr SBBLs. I didn’t know those were a thing, and that's a really interesting bit of ordnance history. But yes, they did come out of naval guns, just really obsolete ones. I’ve replaced the original photo with a re-hosted version of yours. Many thanks.